Our web-based software is FREE with no sign-up so you may use as many times as needed for your cabling project. From any link on our websites in the USA, Canada, UK, and South America, the opening page will show you a basic Tutorial, Tips, and FAQ to help you with your cable labels. On this page, we run through the operation of each area. 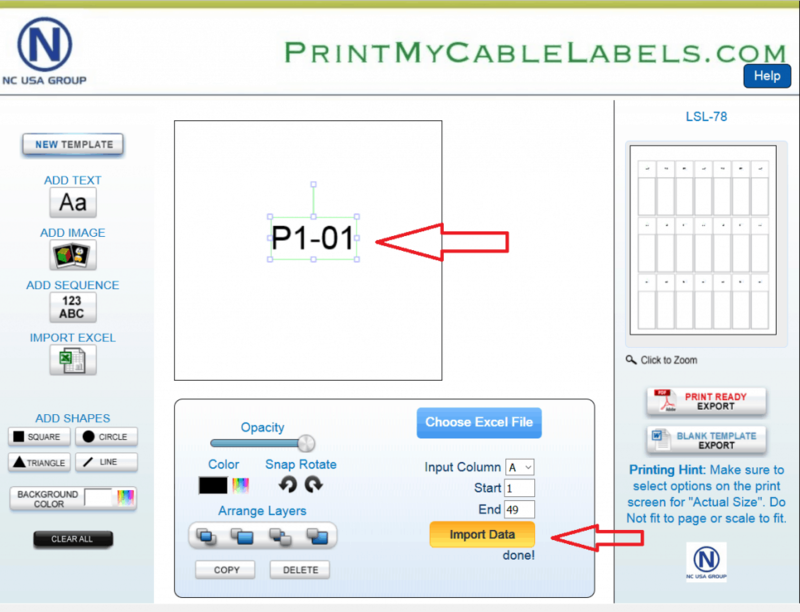 The “PRINT READY EXPORT” button you will press when you have your data inputted into the cable labels. The “BLANK TEMPLATE EXPORT” will produce a blank word.doc for you to use in MS Word if you wanted to go that direction. The Left side we will cover in more details for the production and printing of your cable labels. When using Excel import you must first make sure that your excel sheet is ready and saved at a location you can import from. The first areas to import will be Column A through to the last number on the sheet. 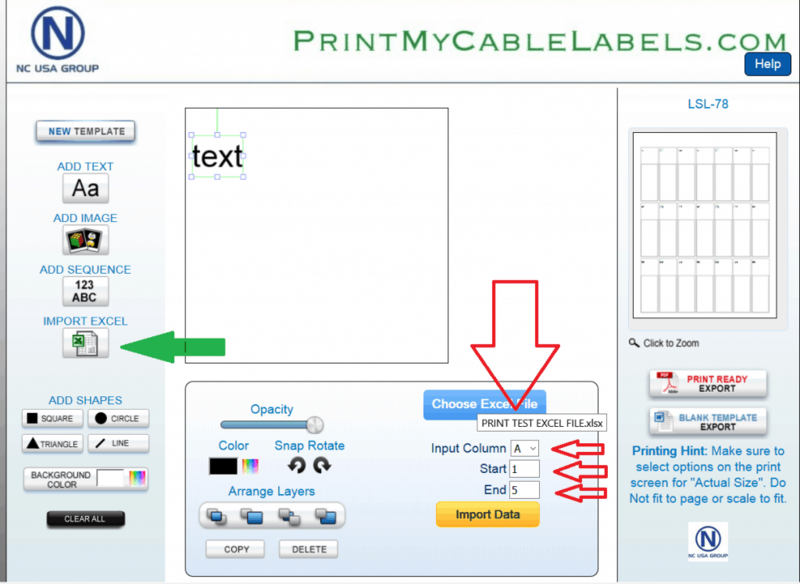 Please make sure that the font and size of the text on the import sheet is correct for your cable labels. When your spreadsheet data is correct and checked, you can start the import into our software. Click the IMPORT EXCEL button on the left (Green Arrow). This will bring a “TEXT” box onto the print area in the top left. This text box if the location of the imported data will be placed. Please position the box in the location on the cable label you need your data. The box can be made bigger by dragging the corners and the box can be placed in any location. Then select the start number “1” and the end line number of your data “49” Click the Yellow “Import Data” button and you should see the text in the box change as the data is imported. This is how it should look after the first import of data from your spreadsheet. You can see the “TEXT” box has changed and the data has been imported. At this point, you can still adjust the size and shape of the “TEXT” as required to print on your cable labels. As all printers are a little bit different, it’s important to test the position of this data before you print your cable labels. 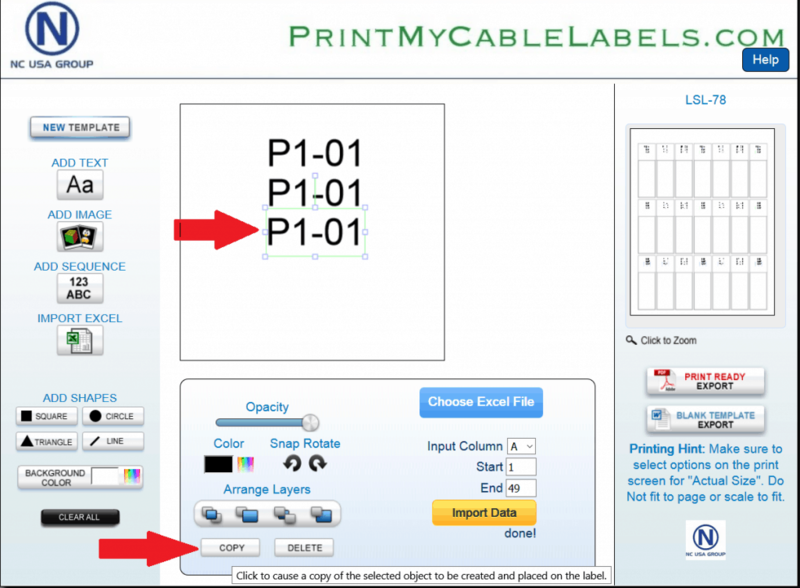 At this point, if your just printing one column, you are ready to print and you click the “PRINT READY EXPORT” on the right to make the .pdf printable cable labels sheet. You can add as many excel imports from columns as you can fit on the cable labels. If you wish to add another column of data please continue below. To add another column of data click the “IMPORT EXCEL” button on the left and it will add another “TEXT” box on the label area. If you are working on the second column of the same spreadsheet, you need to change the “Input Column” to “B” and make sure the start and End numbers are the same to match the first data import. click the “Import Data” yellow button and the second column of data will be added. You can repeat this for as many areas as you can fit on your cable labels, on this label the LSL-78 the max is around 5 lines of data, so that would be A/B/C/D/E this would give you 5 lines of imported data in your cable labels. If you just wanted the same labels 5 x so that the same numbers would be visible all the way around the cable labels, you can import the first, then select the text box until highlighted and click the copy button at the bottom. You can also add fixed text, logo’s, shapes and many other stock images we go into on the add Image section. 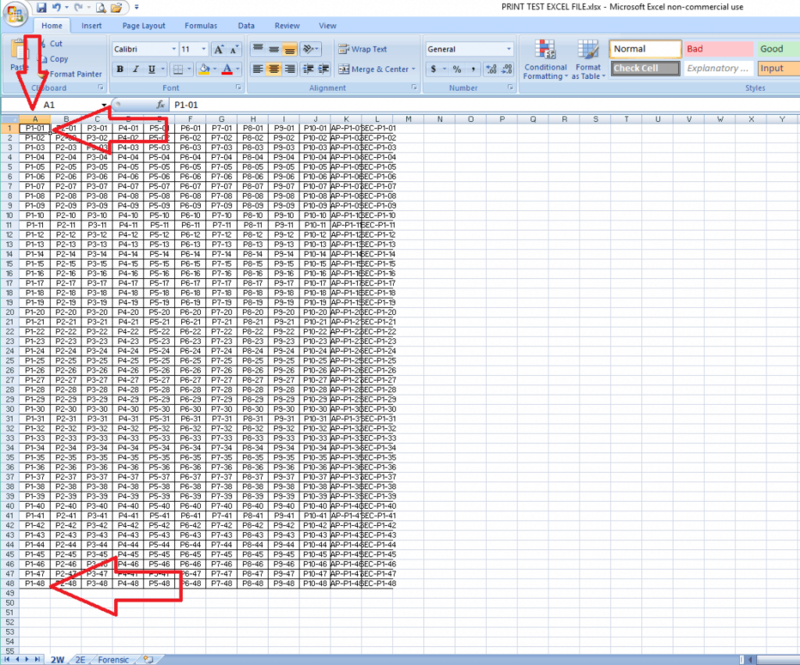 Some excel tips, make sure the data is 100% correct before importing into the cable labels. Excel import if the number is too long and when print ready option it goes past the end of the label, like “340C-342-A0003” when this number is too long it will overrun the end of the labels. The left-hand side you can see the long excel numbers ready for import and on the right the print out if not action is taken. In Excel on the sheet before importing into our labeling software, you can wrap the numbers or text with the following command. The long cell use the command “ALT” “RETURN” so in the cell you would make it 321C-234 (ALT Return) move to next line, finish the numbers, you must use “ALT” “RETURN” standard wrap text will not work. The “ALT” “RETURN” used as seen on left in green will make the labels like on right in Green. 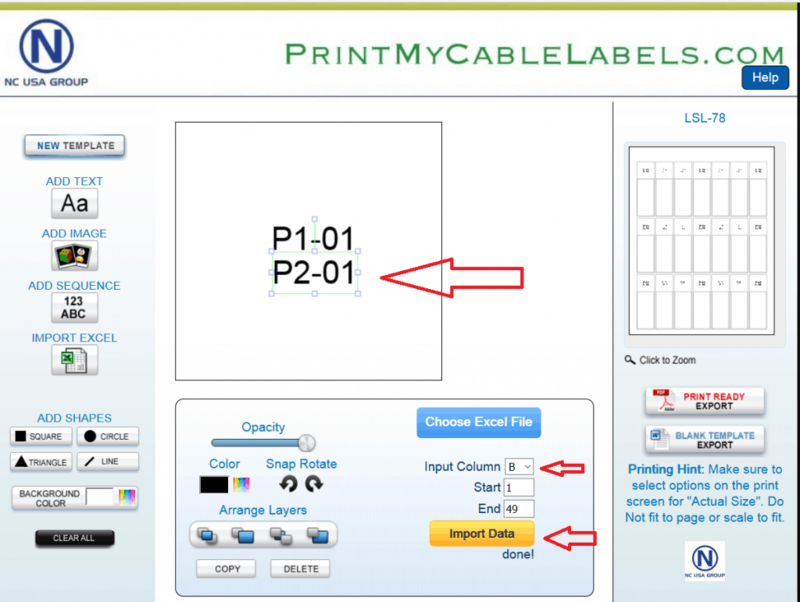 How to make an excel number list to print on your cable labels, what you have to do is open excel file, then place your first cable label number in say “A1” GB001. Then click on the bottom right corner and drag the box down to the number field required. 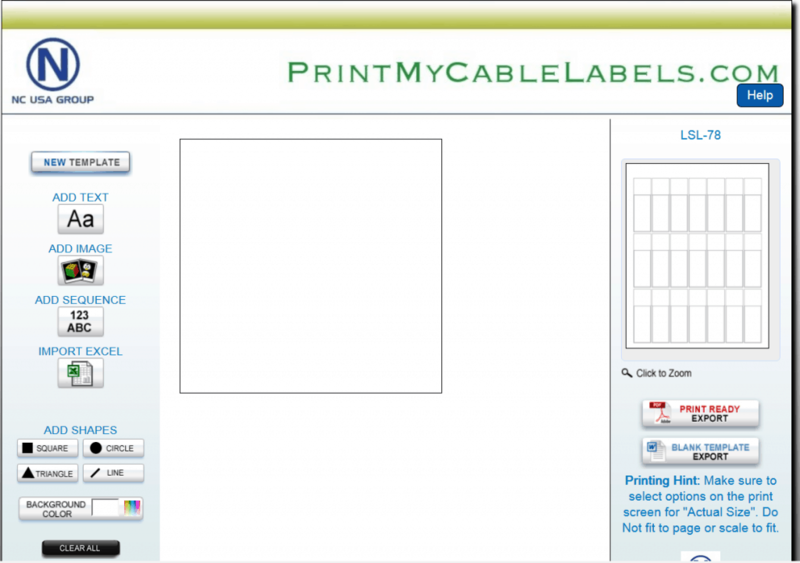 Then Click on “Fill Series”, this will auto-fill your data in the list and after this, you can save the file ready for importing into our web-based software Printmycablelabels.com all FREE with no sign-up and yes you can import from excel.